This topic contains 13 replies, has 2 voices, and was last updated by Stefano 2 years, 5 months ago. what have you tried doing? Does your theme support custom user_meta fields? I don’t think it’s a good idea to allow user to have access to the WordPress dashboard, as this can be a security issue with them knowing that your using WordPress. I use a program that keeps users from knowing that my website is a WordPress site. However, me website does have a user dashboard where they can change or update their email address. So how do I tell my potential users that they can get paid to post? I was hoping that your plugin had an add-on that would indicate to users that they could apply to be a contributor and earn money for posting within the profile page, and add a PayPal email address. Is this not the case? Are we supposed to reach out to every potential user of the website and ask if they want to make money? I was thinking that this would be taken care of within the plugin somehow. I don’t think it’s a good idea to allow user to have access to the WordPress dashboard, as this can be a security issue with them knowing that your using WordPress. I use a program that keeps users from knowing that my website is a WordPress site. I can see what you are trying to do, but you want to hide your server setup from bots, not real users. Or, at least, I can’t see any good reason to not let them know you use WordPress. However, me website does have a user dashboard where they can change or update their email address. Yes, I see it’s done with BuddyPress. 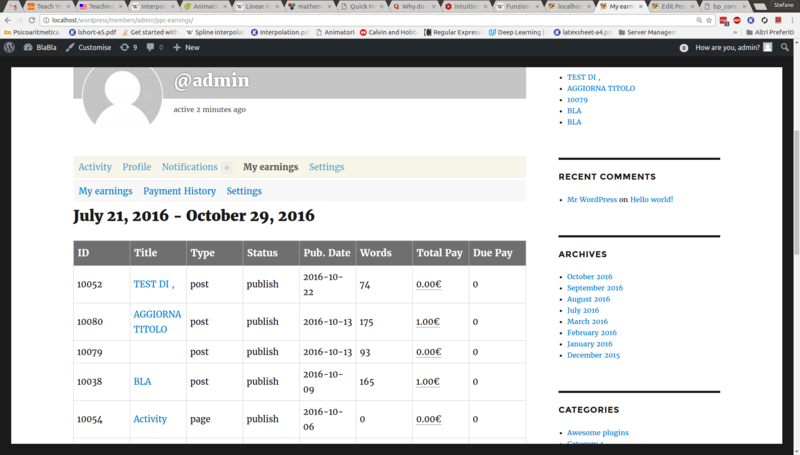 As of now, Post Pay Counter only allows PayPal email to be input from their wp-admin profile page. This choice was made since the profile page is accessible to all user roles. 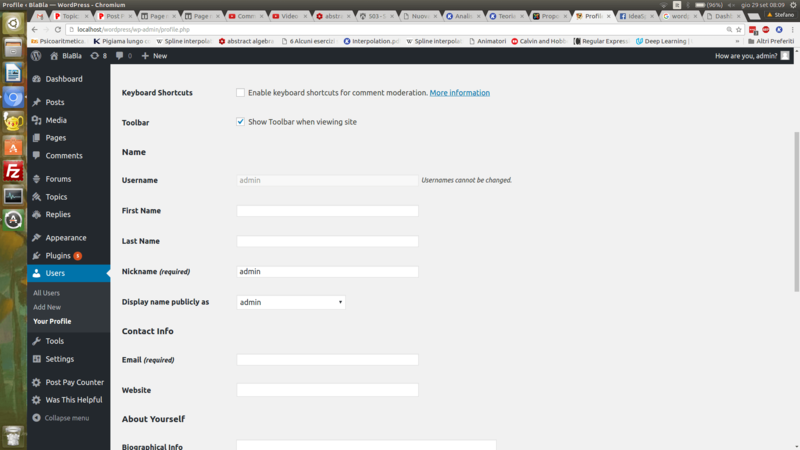 However, more and more webmasters are locking the wp-admin area to their users, and moving everything to the front end. This is a trend that I don’t understand and which I don’t see the sense of, but yet, it’s there. So I will probably provide integration with at least BuddyPress in future releases. I can’t provide a time frame in which it will be done though. Thanks for the explanation. I am happy to hear that you are now planning on adding a BuddyPress feature for PayPal signup. However, how do you propose that I get users to sign up for getting paid until that feature becomes available since I do not allow users to access the WordPress dashboard? Can you provide a feature within the front end where users can see there own earnings, instead of having to go to a page that posts all users earnings; perhaps in their user dashboard within BuddyPress or similar? Is there a way for now to allow only logged in users to see there own earnings within the webpage with the [ppc] shortcode? However, how do you propose that I get users to sign up for getting paid until that feature becomes available since I do not allow users to access the WordPress dashboard? I fear the only way would be to input them yourself, sorry! Doesn’t the shortcode work for you? Do you have an ETA on a Buddy Press PayPal signup feature? That looks amazing! I am excited that you got a chance to get the BuddyPress integration in motion. I am planning on making my website officially live soon, and that is the last thing I need to make my website exactly how I envisioned it. I look forward to seeing the finished updates. Thanks again. The topic ‘Having issues setting up the PayPal settings’ is closed to new replies.